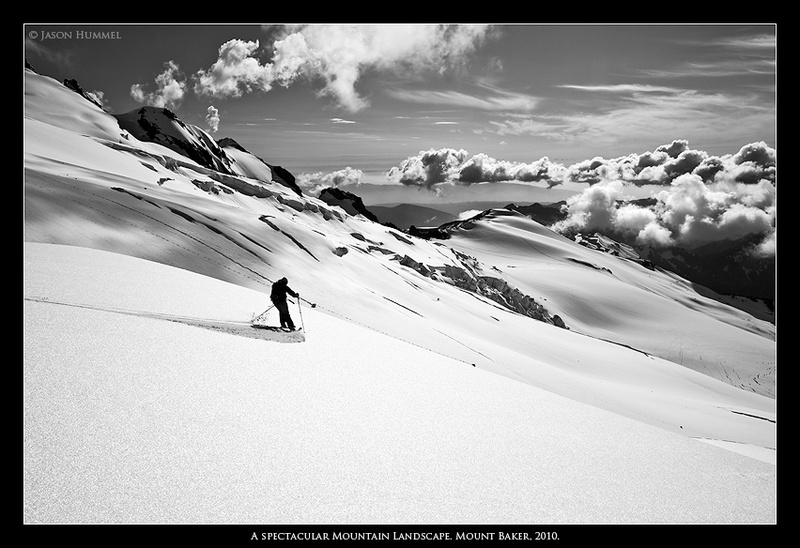 Volcanoes have an appeal that even sharp peaks in the North Cascades can’t equal. They are massive! From their steep faces and crumbling icefalls, cracked glaciers and sloughing moraines to their encroaching forests, glassy lakes and gorging rivers, their grandeur is far-reaching. On Interstate 5 driving or on the back roads of Washington, you can see their snowcapped facades shimmering under beams of sun or moon. There was no seeing any mountain at first. Above my house in Tacoma, the clouds dominated the sky, but as I passed Seattle, breaks began to appear. I guess the forecasted "mostly cloudy with a chance of rain" really meant "mostly sunny." Or so it was in my early-morning day dreams. In them even the mountains maintained these lowland clearings. And as I reached the town of Glacier, a skip and a hop from the mountain, I pulled over to wait for the Traslin brothers. There, while killing time, I ogle-eyed the mountain through the sucker holes of blue, which battled swirling fog. “OMG, it’s going to be sunny!” Analogous to a crumb-covered little boy with his hand in the cookie jar, my face was an expression of uncontained joy. Any attempt to wipe it from my lips, just meant another cookie (or look) was necessary. 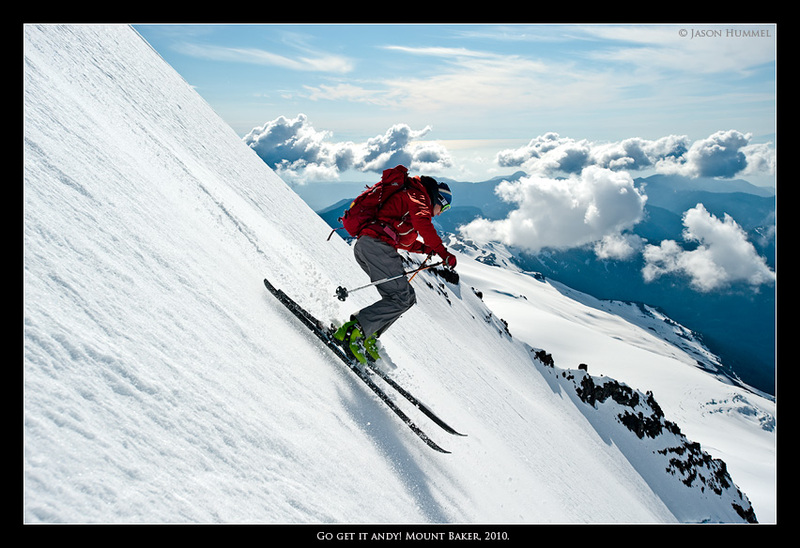 Mount Baker is a standby for ski mountaineers. 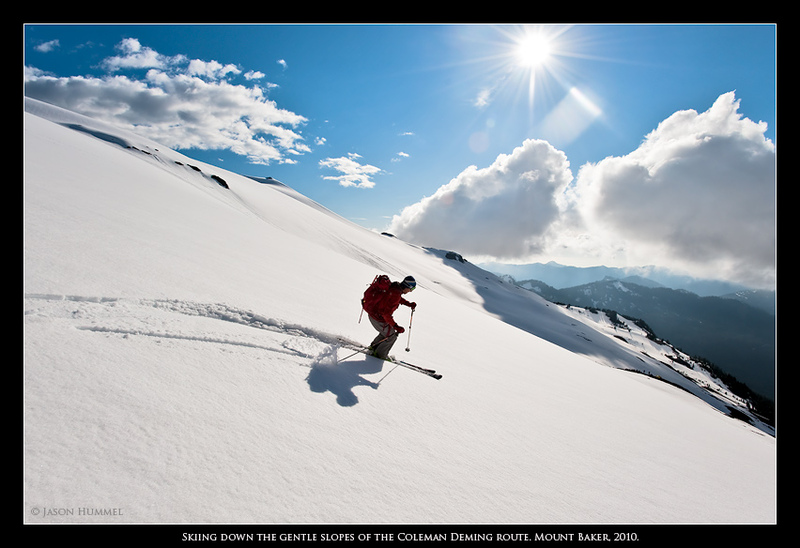 It retains quality snow and skiing longer than its bigger sibling, Mount Rainier, at least from summit to glacier toe. Take one late August as case in point. With friends we schussed our way from the Park Headwall all the way down the Boulder-Park Cleaver before we ran out of snow! 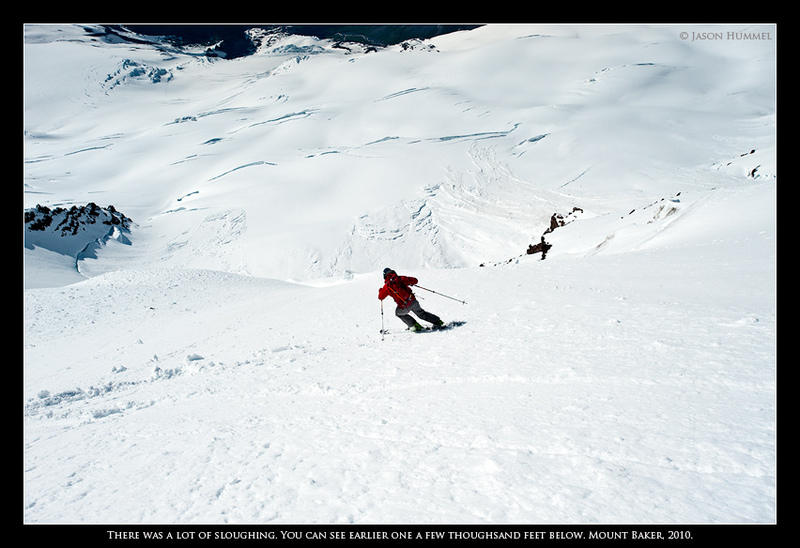 That was 5000 feet of skiing - in summer! 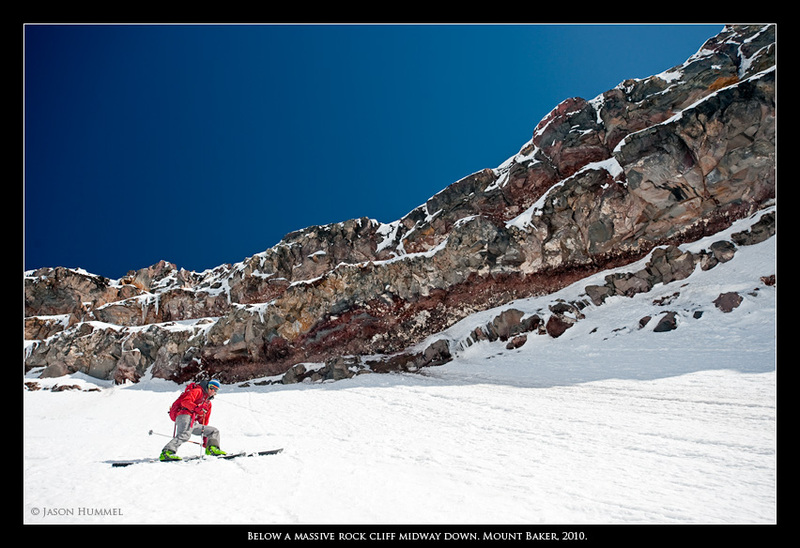 To this day, besides the headwall of course, the Boulder-Park Cleaver is one of the most classic, moderate lines in the Cascades. But for ease of access, the Coleman Deming is hard to beat and that is why the Traslin Brothers and I chose to climb this route. After meeting, we drove to trail #677. 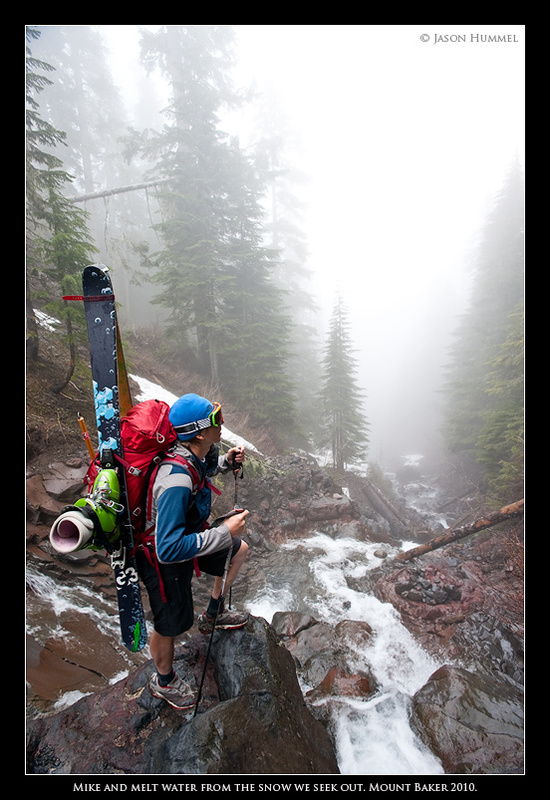 In a short time, with skis, boots, poles and gear we set off at 9a.m. through fog-entombed forest. Glorious skies loomed overhead. They brought on an abundance of good feelings - we were stoked, but those feelings were quickly being swamped by mist and cloud. Our only hope was that we would climb above them. For luck is often a matter of persistence, as not two miles later, the mountain smiled at us from between those buoyant, frothy waves of whiteness. 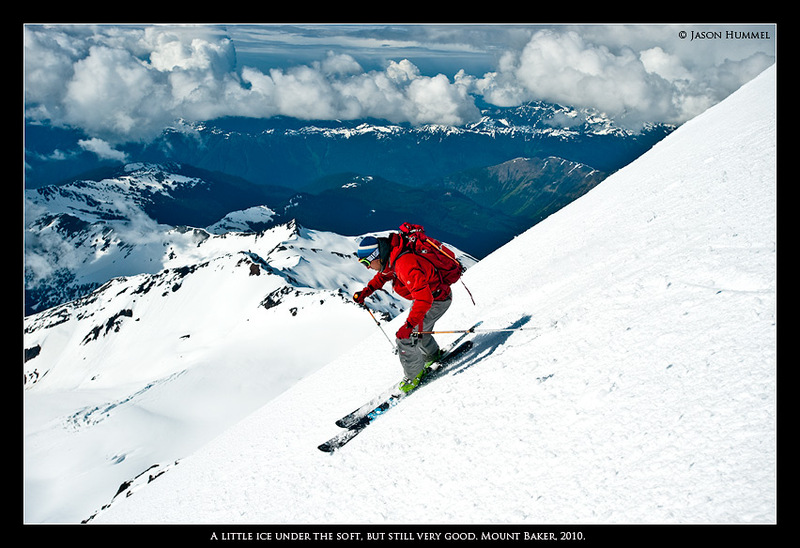 There was a feast of smiles, grins, hollers and laughter being set on our faces as we clamored out of our shoes and into our ski boots; it was time to climb and we were lovin’ life! Given a late start and weather’s poor outlook, we weren't pressing for the summit. Yet failure to grasp opportunity at hand is a fool’s knife into the gut of it. 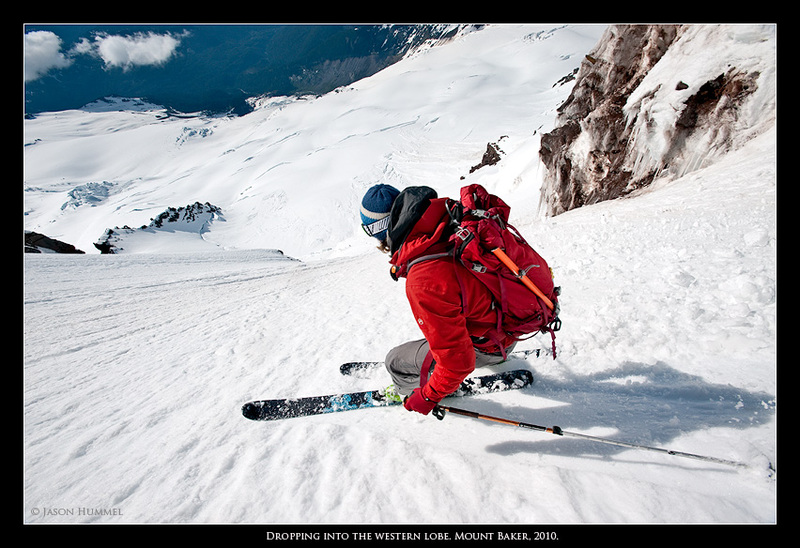 Velvet snow and warming temperatures practically levitated bodies and hopes up the mountain! 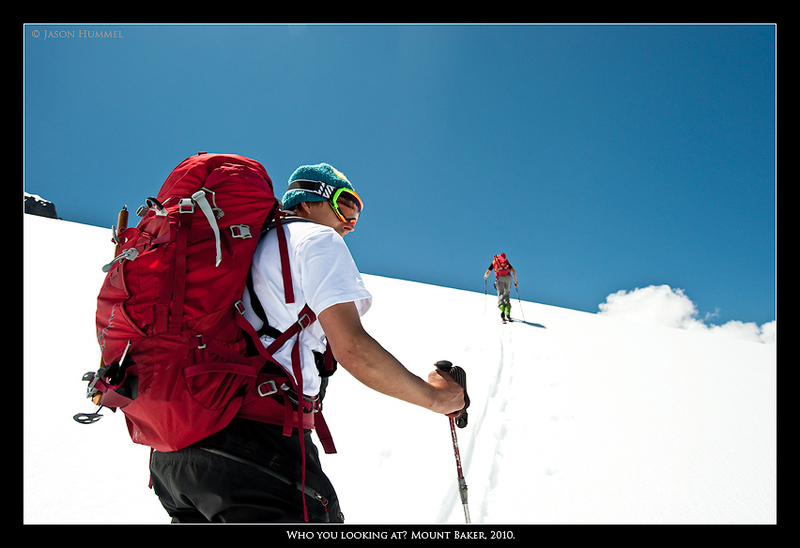 At one point, a climber coming down from the summit hails us and comments, "You guys are sure moving!" The Traslin brothers are fast. From a lifetime of competitive racing, pain and suffering is hard wired into them. Those big, puffy clouds now lingered below us. I fully expected them to press in on the mountain and stack up, but as the day progressed, they didn't threaten us further. Sights of the Twin Sisters Range again reminded me that I must visit them, and soon. But my gawking at the sights was cut short by my need to get to the top. 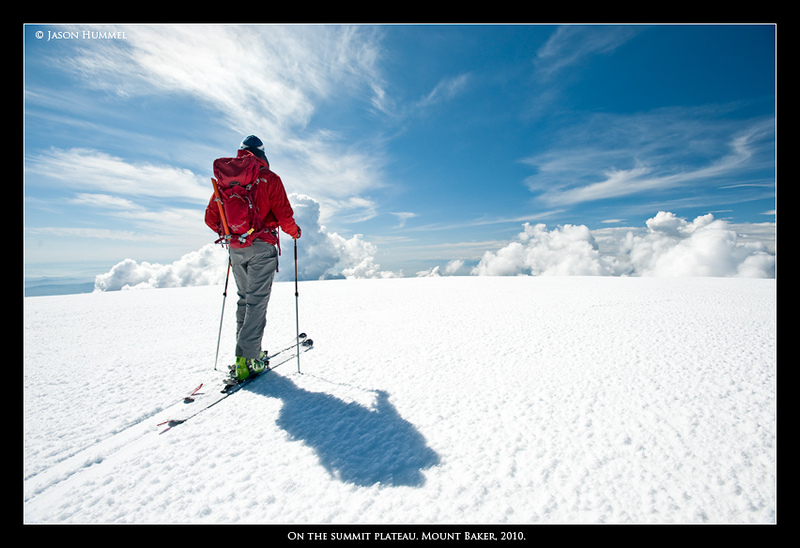 It's twelve miles and 7100 feet to the summit of Mount Baker and back. Besides a few slowdowns for water, we hardly paused. With a spring season whose weather has been less than appealing, a nice day was something to celebrate. If you could've seen my smile and star-crazed eyes, you would've recognized a man infected by this day’s spectacular showing. At 10,781 feet, the top held hardly a wisp of wind and yet, before descending, my hands were shaking from a mix of fear and excitement. That is good. If I wasn't apprehensive before skiing a route like this, then I’ve been skiing steeps for far too long and probably shouldn't anymore. While the Traslin brothers went to the true summit, I decided to wait on the plateau. 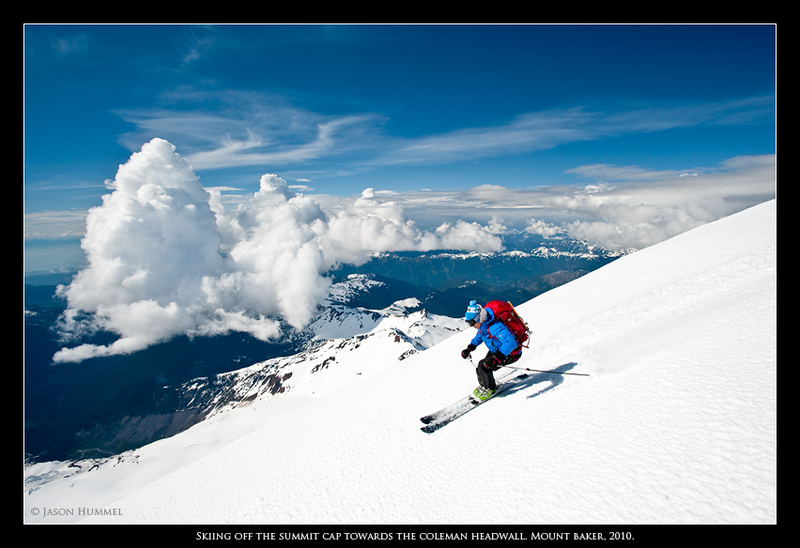 What concerned me was the Coleman Headwall and its 2000 feet of 40-50 degree snow. 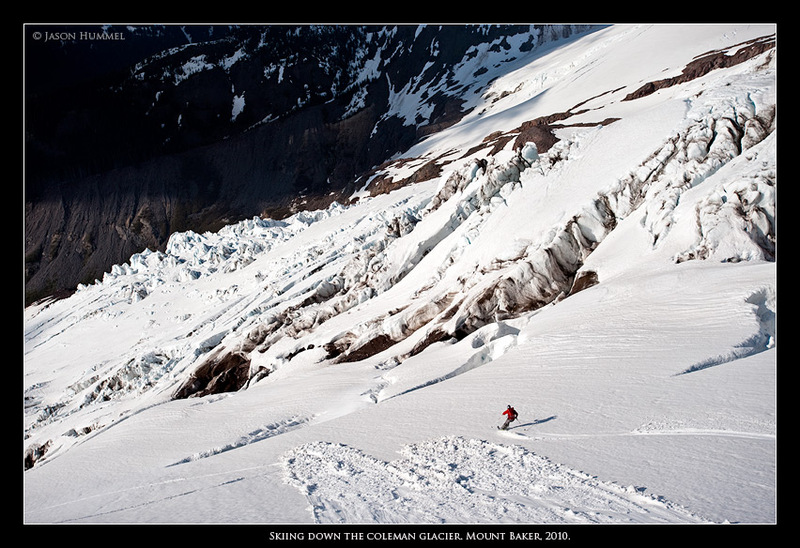 During my previous and only descent of the route in 2007, I skied the Eastern Lobe with Phil Fortier. What excited me most for this trip were potentially prime conditions on the Western Lobe. As the brothers arrived back from their summit bids, I pressed forward. 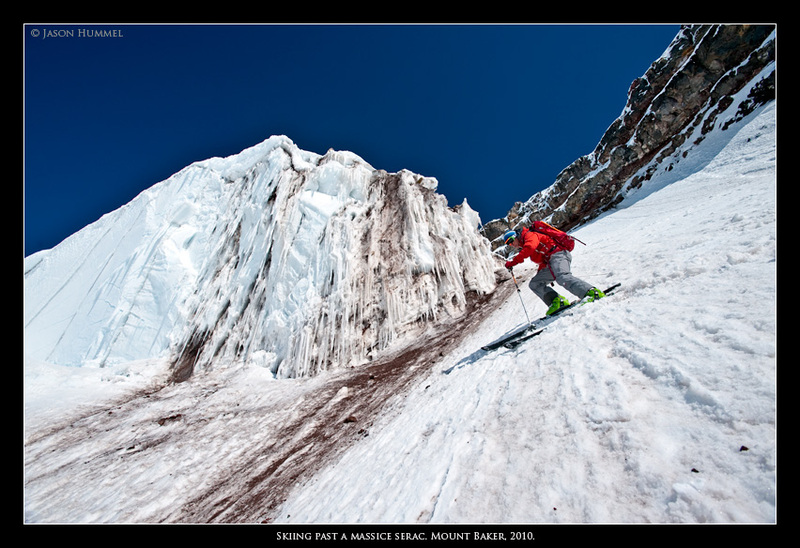 Skiing onto the face from the flat expanse of the mountains icecap to the steeper north side has an affect on me that I never tire of. The feeling is akin to peering from the edge of a tall building to city streets far below. And I love that wild, impractical foolishness of putting oneself under risk’s wheels for-no-particularly-good-reason, of my edges gripping the slope for all they're worth and of my heart in my mouth trying to beat some sort of sense into that thick head of mine. 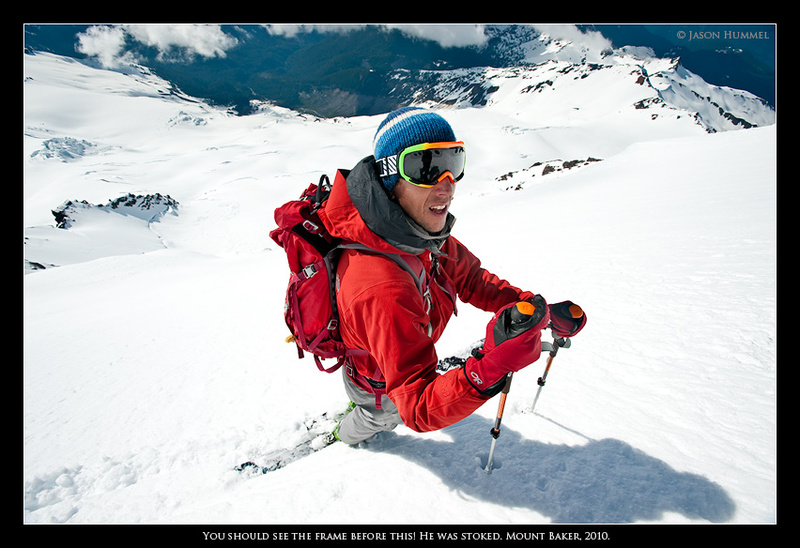 Mike, on the other hand, felt too much was against us (no rope or crevasse gear). I can't blame him. 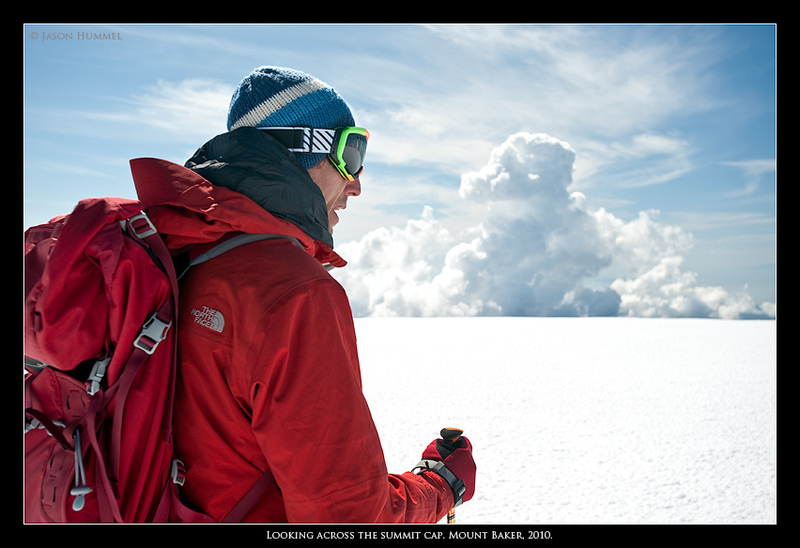 There's an indefinite amount of risk you take in skiing steep routes, and our plan puts us right between the cross hairs of rock and ice cliffs, which add even further danger. And yet, his brother Andy is young and unwise like me. While apprehensive, he was still willing to leap into the firing range. Mike donned crampons and climbed back out. 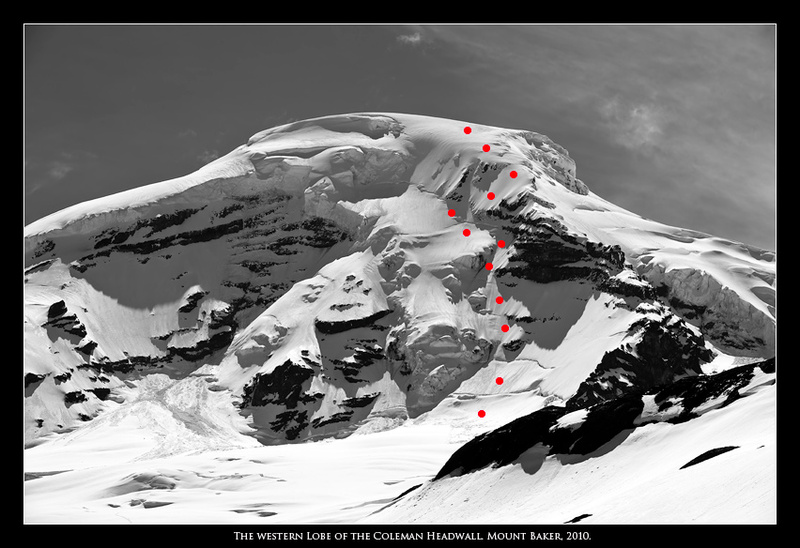 He would descend the Coleman Deming route and we'd meet him at the bottom. It is good to know one’s limits; I always respect people who don’t let bravado push them into situations they aren't comfortable with for whatever reasons. 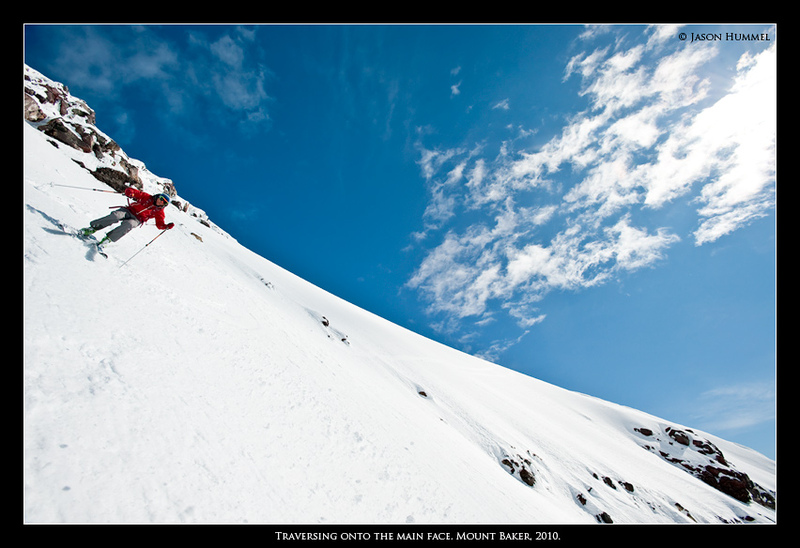 With careful negotiation, Andy and I cautiously picked our way down the face. 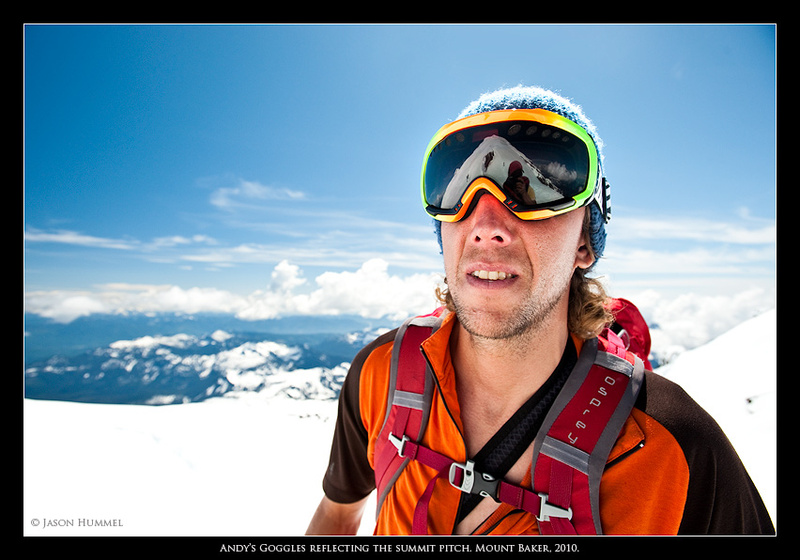 During my breaks, I would look up or down and watch Andy turn. 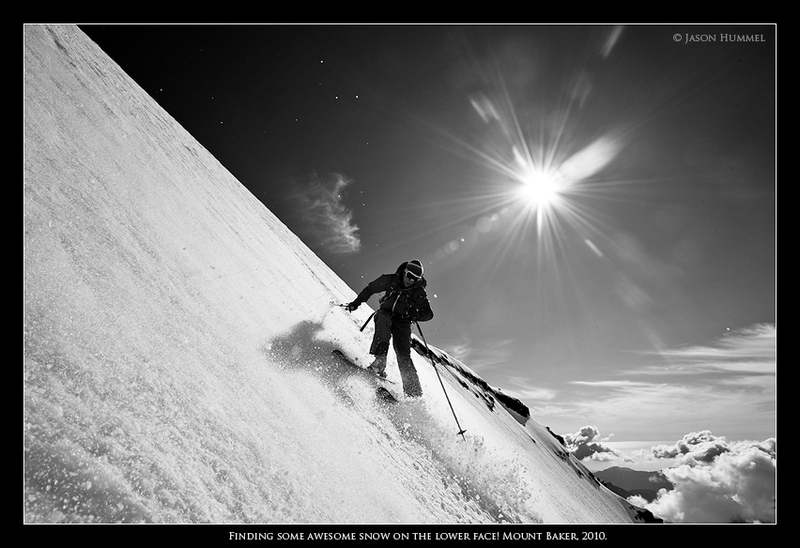 With steep skiing there is a freedom of being unrestrained, unhooked from the flat plane of Earth and tilted on an icy slope to be sent sliding downward. 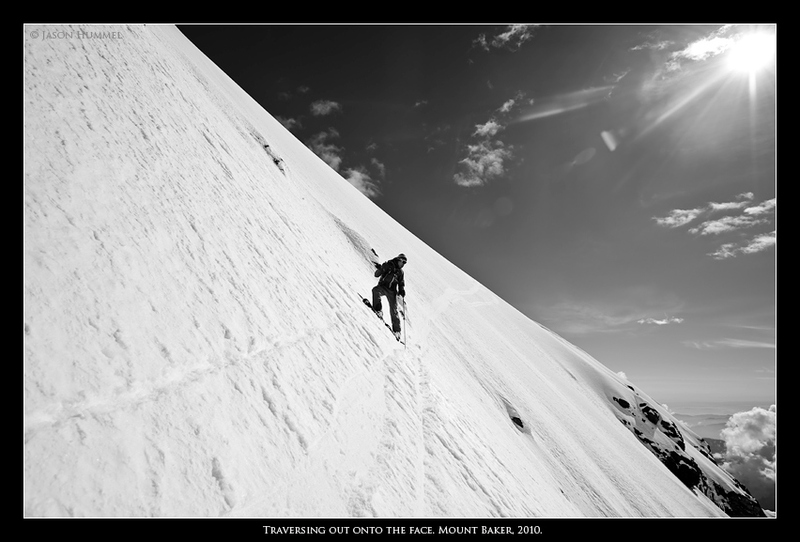 Unresolved as you are with gravity, perched in its realm, it is quite thrilling to find yourself once again on level ground, knowing you had navigated terrain challenging enough to test your solidarity and cohesion with the mountain environment. As a photographer I find it especially thrilling to be cast into the center of this excitement, right in the action. It is difficult to keep my feet under me when I am so overwhelmed by the sights. Once the camera is away, all bets are off because it is time to descend and that’s why my heart beats and lungs breathe. 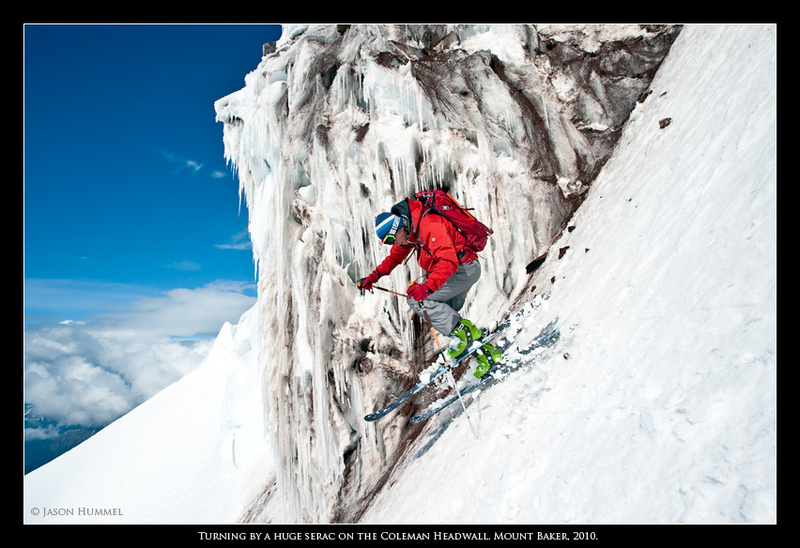 We wound our way to the far extremities of the headwall to bypass an icefall on harder snow that was less likely to slough away under our feet. It was nearly icier than we had hoped for, but after a few turns it softened. To our left, the face opened up even further. 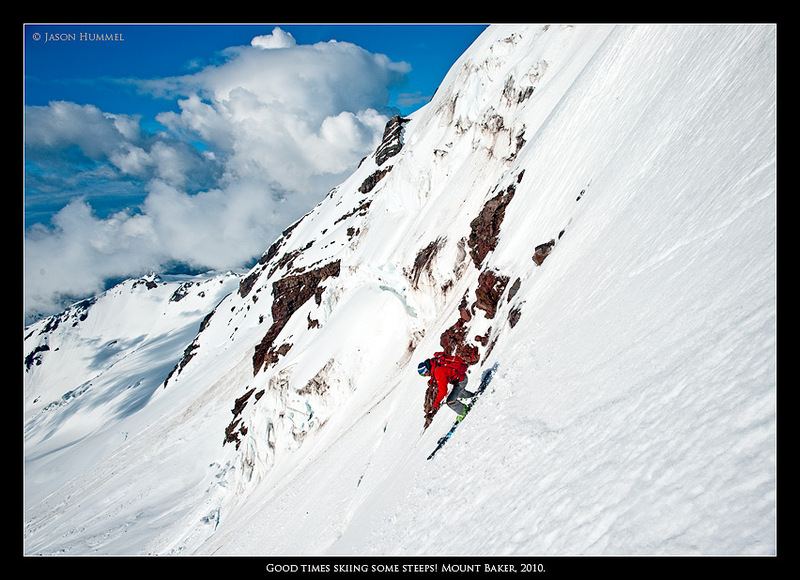 Five hundred feet below was a double set of bergschrunds, so we continued along a leftward traverse. 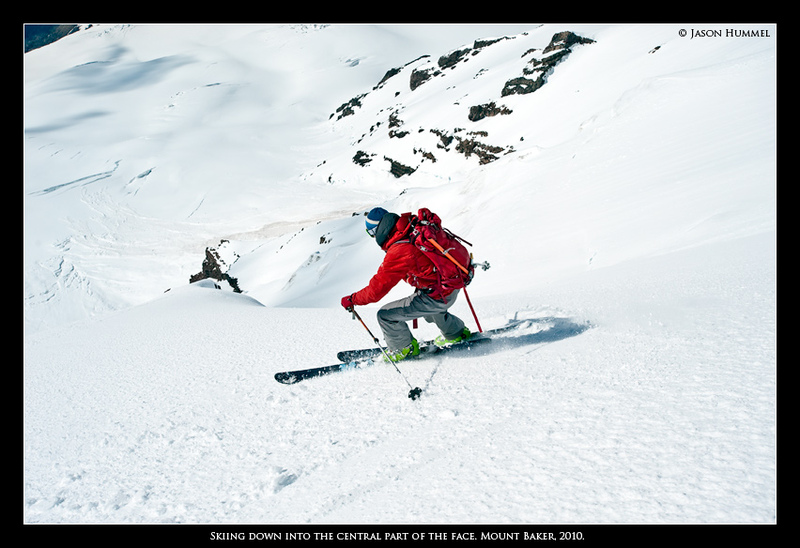 Because the westerly-most face receives less sun, we had amazing turns all the way to those bergschrunds. 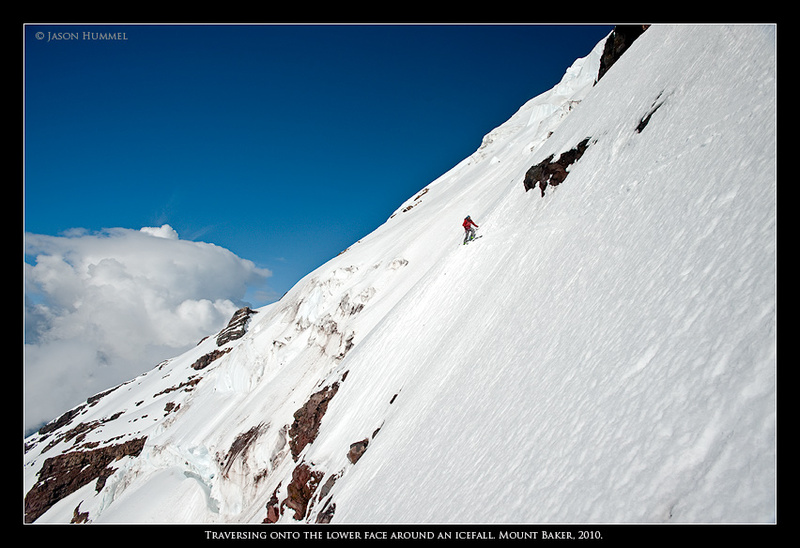 A jump and traverse and we were free from the face and skiing outward to a point we could take in the entire route. It was a beauty! 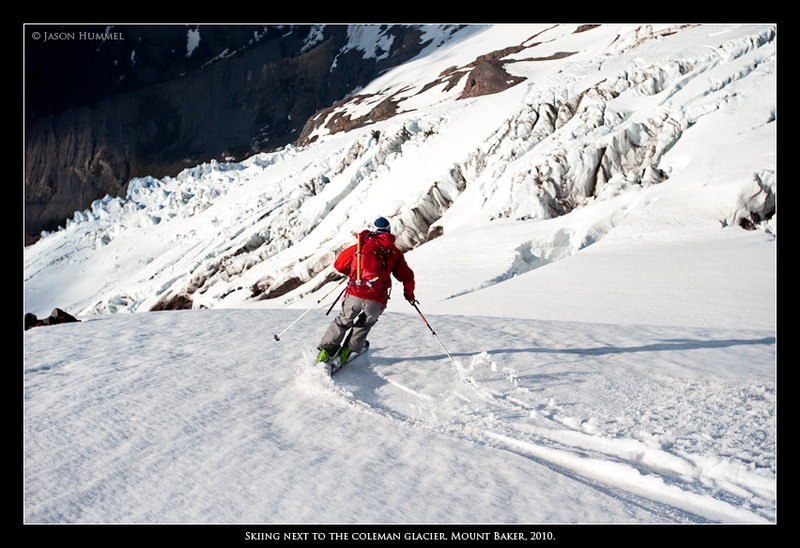 While zigzagging my way through deep crevasses on the Coleman Glacier, I realized how much I adore Mount Baker. It is one of my favorite volcanoes. 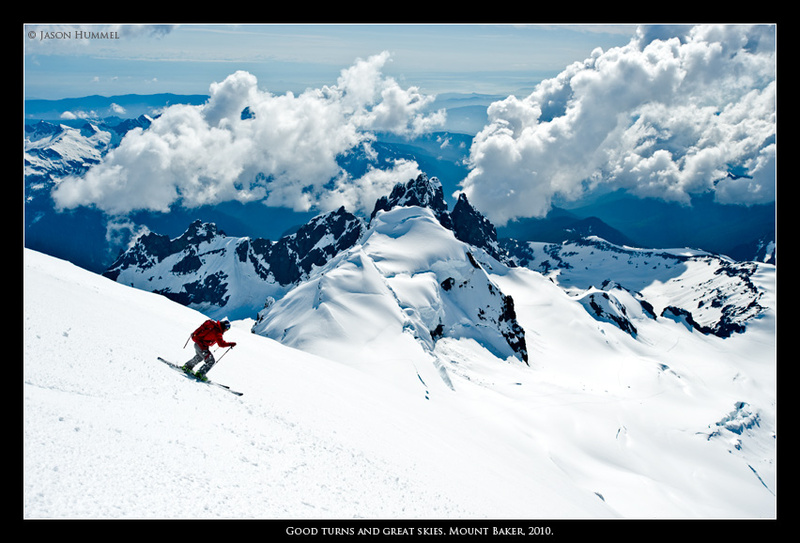 Not only because it has everything a skier and photographer would want - steep lines, big glaciers, encroaching forests, roaring rivers and placid lakes, but because it has a personality, an aged wisdom about her. 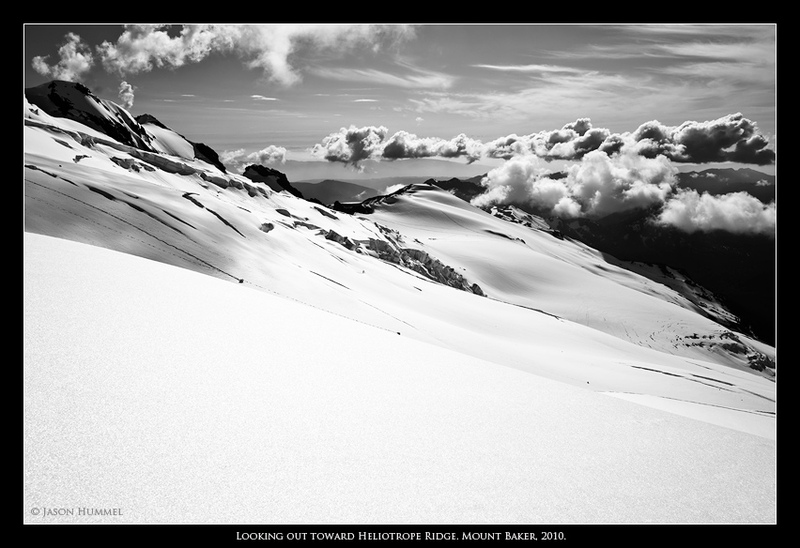 Gazing back to the snow and my ski tips, I kept mulling over my reasons for being here, even after Andy and I reconnected with Mike far down on the glacier. And even beyond to the hike through the forest to the cars and to Interstate 5 on my way home. 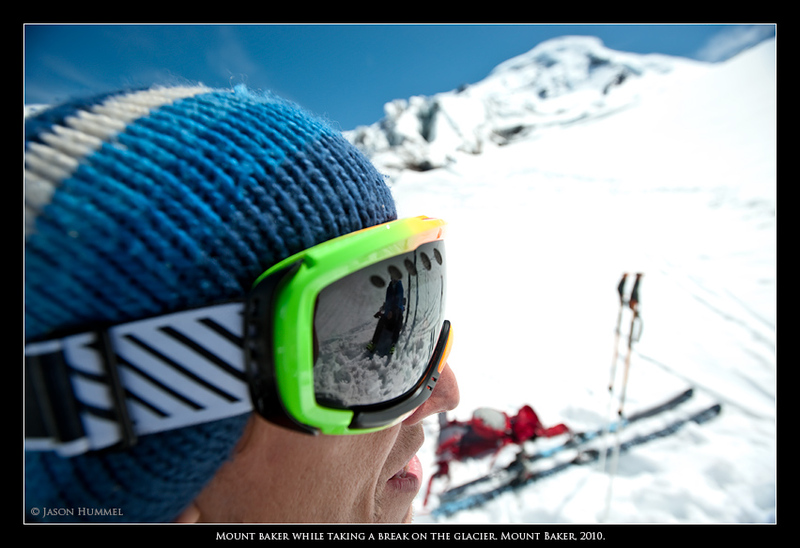 Hours later, over my shoulder from my driver’s seat, I couldn’t help but steal glances of the moonlit- graced slopes of Mount Baker. Looking away, I realized that volcanoes can be as exhilarating as the rock-studded peaks of the North Cascades. 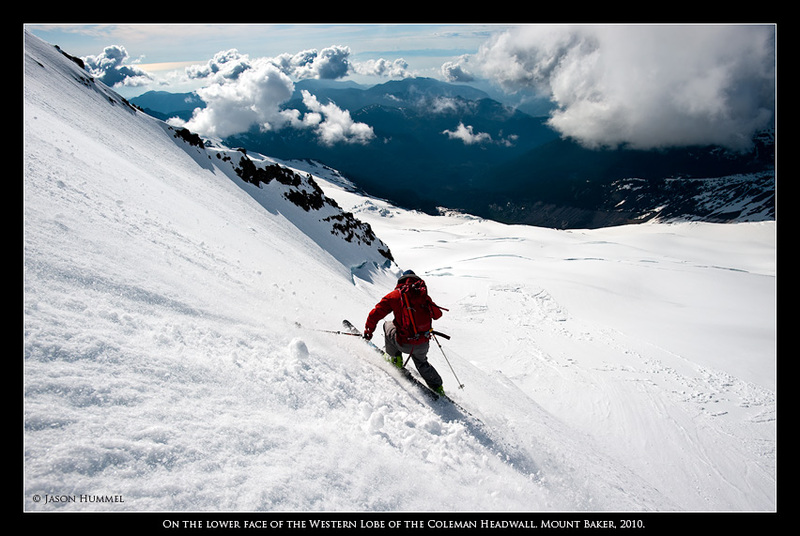 I think you just have to get closer to their wrinkled, crumbing, and shadowed faces to really experience them for what they are as we did on the Coleman Headwall. If you like my photography or writing, please see my photography/contact page for prints and/or licensing.